If you spend as much time on Instagram and Pinterest as we do these days, then you already know how effective they can be for connecting with an audience of like minded creatives. However, when it comes time to direct this new audience to your website, things can get a bit challenging. The problem is that many social networks like Instagram and Pinterest only allow you to add one single link to your profile—that’s not enough! This is where your “link in bio” page comes in handy! By creating a dedicated page that holds multiple links, you can overcome the struggle of the single link limitation and start directing that hard-earned traffic exactly where it needs to go. While platforms like Linktree or Lnk.Bio try to serve as a solution, it can end up being a costly expense for your business. Not only that, they also don’t offer a lot of customization options to highlight your unique branding. Save some money and create your own customized page for FREE on your Squarespace website. We are going to walk you through the process step-by-step. It is simple and straight forward - you’ve got this! Before you get started, determine what links you want featured on this page. We recommend including your home and sales/services page for sure! Other ideas could include your latest blog post or a freebie that you are promoting on your Instagram. Want to Build an Irresistible & Profitable Website? 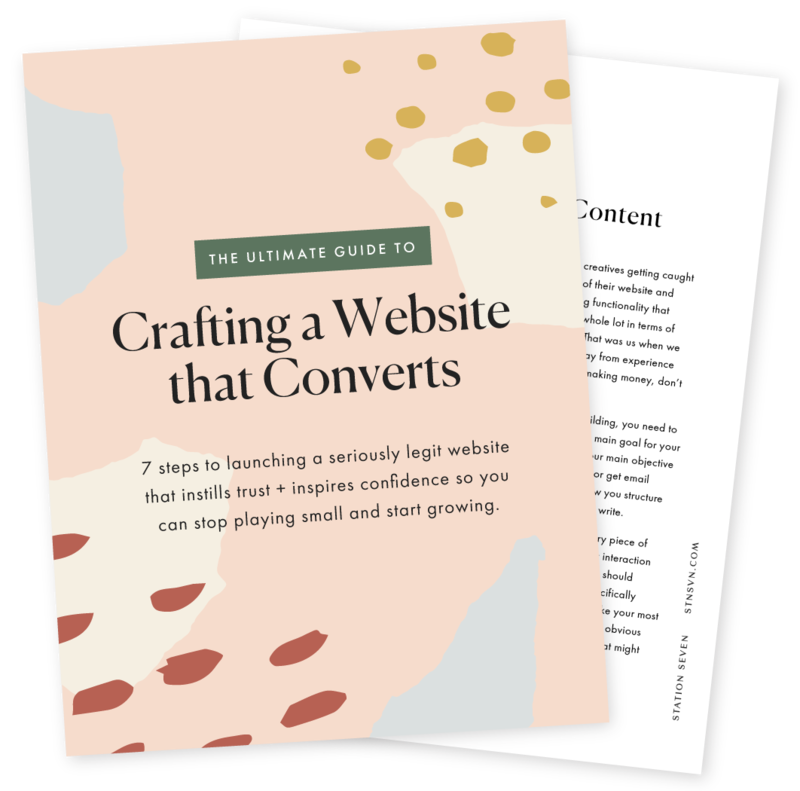 Grab our 7 steps to launching a seriously legit online presence that engages + converts! Start by creating a Blank page in the Not Linked section of your Squarespace pages menu. You can name your page Welcome or Link in Bio, whichever you prefer. We’ve added a banner image to the top of our “link in bio” page to create a visually striking layout for our visitors to land on. Banner images are supported in all Squarespace templates in the Brine family, as well as most other template families. After you have created your Blank page, navigate back to the Pages menu. Here, you will need to select the gear icon next to your page name. Once you select the gear icon, your settings menu will open. Click the Media tab of your page menu and upload your banner image. After you have added your banner image, you can insert a spacer on top of your banner image to expand the image block—this allows you to make the banner image even taller. Once you have added the spacer content block, select the light gray circle towards bottom part and drag to increase the height of the spacer. Increase to your desired height and make sure to select save. Next, we will add in the heading text and quick links. You will create these items by adding content blocks to the Page Content portion of your page. Add your quick links through buttons, we recommend using small buttons. You need to remember that the majority of the people visiting this page will be viewing this content on their mobile devices - so keep the page length short and sweet. When adding buttons for direct links to portions on your website, in the Clickthrough URL button option, make sure to select Content. From here you can scroll to find your existing Squarespace site page you would like to add. For items such as specific blog posts or affiliate links you have for your business from other platforms, you can add the full URL to the Clickthrough URL box. After you have completed adding in all of the buttons and links, make sure to hit Save. You can now add this page URL to your social media platforms, like your Instagram bio page! We love how this free and simple option can provide the direct links you need to share, all while presenting it in a way that is on brand for your business! If you have any questions or tips you can share, let us know in the comments below!